New Delhi - November 30, 2017 – Dpauls Travel & Tours Ltd, a leading brand in the Travel &Tours industry, celebrates its twenty-fifth anniversary next month. Since its inception in December 1992, DPauls has today established itself as a market leader in Travel, and today offers a full complement of travel related services,including Air travel, Domestic & International Holiday Packages, Hotel& Tours reservations worldwide, as well as Cruise holidays. It is today associated with some of the leading Global Travel Brands, including Disneyland, The Venetian Macao, Sands Resorts, Europamundo and Ocean Park. It is also a leading PSA for the very popular Star Cruises as well as Dream Cruises in India. DPauls also has a significant presence in both, B2C as well as B2B domains, as well as in the Online arena. It is also a developer of Travel Technology and provides White Label solutions to the travel industry through DAN – The DPauls Affiliate Network. "Over the last Twenty Five years,DPauls has remained strong throughout the many changes in the economic climate as well is in the ever-evolving travel trends," said the Director of DPauls. "We attribute our success to two things: First, a singular focus on the customer by constantly monitoring the pulse of the market and developing products based purely on the needs of the customer. Second, we continually look for ways to optimize our operations in every single area of the business. Ongoing product innovation is critical to long-term growth, and this also serves both our customers and our company very well. We are delighted to have reached this milestone, especially in such a dynamic marketplace, and are really happy to be able to celebrate the occasion with our valued partners, customers and well-wishers. " DPauls has regularly won industry recognition as a trendsetting and innovative organization in delivering customer satisfaction. Over the years it has won over 90 awards and accolades,including the coveted National Tourism Award for the year 2013-14, from the President of India, and the Most Innovative Foreign Tour Operator In South Asia Award from Tourism Malaysia in 2010-11. The company attributes its track record of constant growth and success to its investment in people, processes, and technology. To kick off its anniversary celebration, DPauls will launch an online campaign with fun quiz contests and special offers everyday for 25 days, starting 01 December 2017. For details, visit our website at www.dpauls.com/25years or call us at 91-11-66211111. D Pauls Travel & Tours Ltd was honoured with the National Tourism Award for Best Domestic Tour Operator for the year 2013-14,by the Ministry of Tourism. The award was given out by the Hon’ble President of India, Shri Pranab Mukherjee in an event organized by the Ministry of Tourism at Vigyan Bhavan in New Delhi. Travel & Tourism organisations were honoured in recognition of their performance in their respective fields and also to encourage healthy competition with an aim to promoting tourism. D Pauls was awarded the third prize for its contribution to promoting and selling Domestic Tourism Products, based on their productivity for the year 2013-14. A story of exponential growth since 1992, D Pauls today holds a unique brand image in the Tourism Industry of India. More than 80 Awards & Accolades won by them since inception are a silent testimony to their commitment towards customer satisfaction. With a strong customer base of both, direct as well as B2B customers, D Pauls today services more than 1800 sub-agents and 1,20,000+ passengers in India annually. A leading player in Domestic as well as Outbound market, D Pauls has a strong market presence, both online and offline, and is also the online service provider to Delhi Tourism. DPauls Travel and Tours Ltd. has entered into a collaboration with the prestigious Fortune Group of Hotels as its General Sales Agent (GSA) for India and Canada. Ensuring transparency, the association is aimed at providing a wide range of quality services to customers. The tourists from these two countries often find it troublesome to get decent accommodation facilities when travelling to UAE. The pact between DPauls and Fortune Group is aimed at extending quality services to people in this regard. Furthermore, the initiative is planned to remove all mediators or agents and keep a transparent connection between the tourist and the hotel management. Fortune Group of Hotels, a privately owned hotel company, is one of the leading hospitality providers in the UAE region. Led by Mr. Praveen Shetty, it is headquartered in Dubai. This rapidly growing company currently owns 8 hotels in Dubai and Fujairah in UAE. It has two ongoing projects slated to be inaugurated by 2015, taking the count to 10. Established in 1992, DPauls Travel and Tours Ltd. offers holiday tours, honeymoon travel packages, sightseeing tours, transfers, hotels, cruises, flights and other travel-related services. The company has offices in New Delhi and Mumbai. 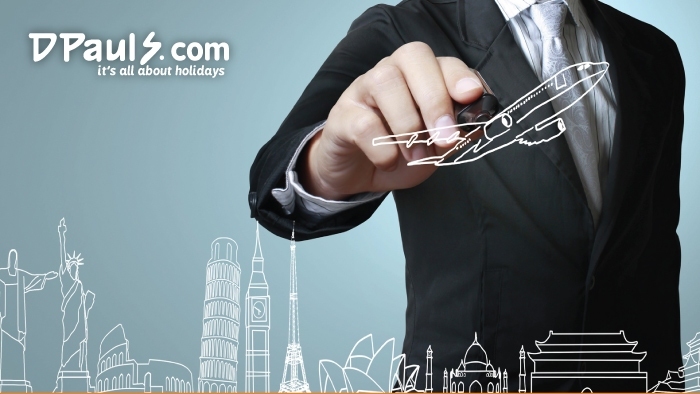 DPauls has created a content customer base over the years and is a preferred travel agency in India. 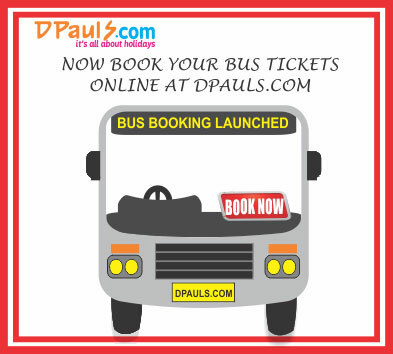 DPauls adds one more feather to its hat with launching Online Bus Booking! Buses are an important mode of travel in India. It carries a large chunk of travellers from one place to another. Be it Jammu of North India or the South-Indian state, Kerala, there are always innumerable buses moving to and fro carrying huge number of passengers. Owing to this timeless never ending mode of travel, DPauls has now dived into the sector of Online Bus Booking also to give a long left service to its customers. Everyone can now easily book bus tickets online on DPauls’ website. It is a totally hassle-free way of booking bus travel. Tourists can choose from a variety of buses including sleeper, seater, semi luxury sleeper, Non AC deluxe seater, etc. Online booking of bus tickets is the best way of booking to any travel destination considering the convenience it provides. You don’t have to go all the way to the bus station and stand in long queues with the screeching noise of public and sweat along with other people! You sit on your comfortable chair in your AC room, sip coffee and book your tickets. That’s called a fresh start to holiday planning. The bus reservation system on dpauls.com is simple-n-smart. It provides a wide range of options right from the pickup point to your preferred choice of seat. Choose from the various available buses like Volvo, AC luxury, Deluxe, Sleeper, Express and other private buses. The payment option will also come easy with debit/credit card facility, net-banking or cash payments can also be accepted in some cases. Marketing Head is very delighted about introducing the new service. “We have successfully started with bus bookings now and we are expecting a good response in times to come.” he says. So, bye-bye to bus ticket counters. Log onto dpauls.com, click on Bus Booking option, enter the details of departure date, point and arriving destination and then book from the available options and give a kick start to your travel. Buses being one of the most common ways of transport in India,it empowers a traveller to plan his trip instantly and comes easy on the pockettoo! Bus bookings are now catching the preference of sophisticated class also with the introduction of lots of new deluxe buses and Volvos. This has resulted in a significant change in the experience of bus travel. The major pull against bus travel was the booking ofbuses by standing in long queues, getting sweaty with crowd and sun; resultingin a very unpleasant start to a trip, not to miss unnecessary wastage of time.Online bus ticketing comes as a relief gate for people travelling in bus. It takes only a few minutes, you can select your preferred seat, preferred timing,compare different bus operators, and all this on a good fare deal! DPauls, being always on the move to make travelling a happy experience for all has now taken a step further on its online portal. It is all set to start Online Bus Booking service on its portal where people can book their buses online avoiding unnecessary hassles and save time. The Managing Director says, “We seek to strengthen our product offerings continuously and ensure that we remain the first preference for every traveller for any of his travel need." The bus reservation system on dpauls.com is simple-n-smart. It provides a wide range of options right from the pickup point to your preferred choice of seat. Choose from the various available buses like Volvo, AC luxury, Deluxe, Sleeper,Express and other private buses. The payment option will also come easy with debit/credit card facility, net-banking or cash payments can also be accepted in some cases. Marketing Head is very delighted about introducing the new service. “Now all the tourists can have a pleasant experience right from the start. One can choose from a variety of buses being Volvo, sleeper, deluxe, whatever people want in much less time”, he says. Log onto dpauls.com, click on Bus Booking option, enter the details of departure date, point and arriving destination and then can easily book from the available options. Now you don’t need tostand in long queues or get touchy with crowd! Book bus tickets online in the comfort of your room. Buses are one of the most common ways of transport in India. No tension of long planning, there is instant booking and it’s easy on the pockets too! Lately bus bookings are catching the preference of sophisticated class with the introduction of lots of new deluxe buses and Volvos. This has resulted in a significant change in the experience of bus travel. Till now, the major pull against bus travel was the booking of buses by standing in long queues, getting sweaty with crowd and sun…all resulting in a very unpleasant start to a trip, not to miss unnecessary wastage of time. Online bus ticketing comes as a relief gate for people travelling in bus. It takes only a few minutes, you can select your preferred seat,preferred timing, compare different bus operators, and all this on a good fare deal! DPauls, being always on the move to make travelling a happy experience for all has now taken a step further on its online portal. Dpauls.com is soon starting Online Bus Booking service where people can book their buses online and avoid unnecessary hassles and save on time. Says the Managing Director, “We seek to strengthen our product offerings continuously and ensure that we remain the first preference for every traveller for any of his travel need." The bus reservation system on DPauls is simple-n-smart. It provides a wide range of options right from the pickup point to your preferred choice of seat. Choose from the various available buses like Volvo, AC luxury,Deluxe, Sleeper, Express and other private buses. The payment option will also come easy with debit/credit card facility, net-banking or cash payments can also be accepted in some cases. One has to just log onto Dpauls.com website, click on Bus Booking option, enter the details of departure date, point and arriving destination and then can easily book from the available options. So congrats! Now you do not need to stand in long queues or get touchy with crowd! Sit in the comfort of your chair and book bus tickets online.